Earlier this year, we announced that SenchaCon 2014 is coming to the San Francisco Bay Area, November 10-13. Stay tuned for news on early bird discounts. Sign up now to be notified when registration opens in early summer. In planning this year’s conference, we are constantly reminded of how much fun we had in Orlando last year. But beyond the parties, the contests and the swag, SenchaCon is best known for delivering amazing technical content covering all aspects of the HTML5 and Sencha ecosystems. In this session, Don Griffin covers the new technologies and features that will be coming (and are now available!) in Ext JS 5. 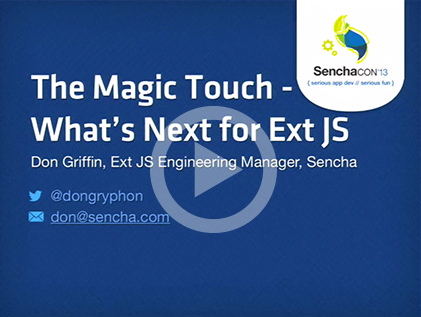 Don goes into great detail describing how touch events, changes to the core package, and other new features will affect Ext JS applications. If you are currently using Ext JS 4 and considering the upgrade to 5.0, you can’t miss this video. 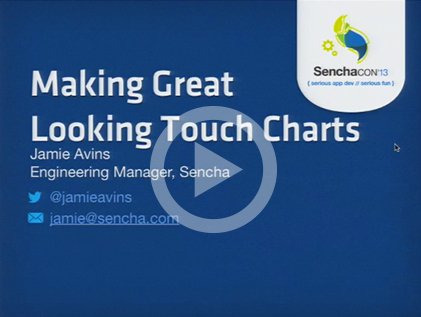 In this session, Jamie Avins teaches us how to use the Sencha Touch plugin-free charting library to create amazing visualizations for your next app. Jamie dives into some great code examples, featuring everything from fully customized colors, size, and positioning to HTML overlays and even synchronized components! 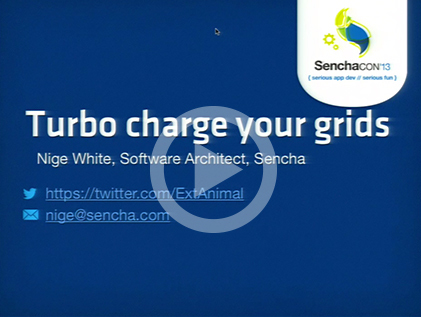 This session is particularly relevant today as Ext JS 5 now shares the same charting library as Sencha Touch. Steven Roussey offers some tips, tricks, and advanced techniques for working with Chrome DevTools, Safari Web Inspector, Mozilla DevTools, and Firebug. Learn new ways to navigate your source code when debugging, measure the performance impact of your code and your theme choice, and get up to speed on a new project quickly. 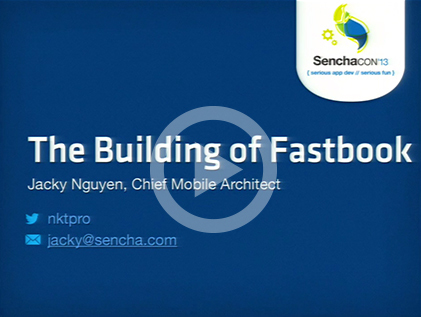 Sencha built Fastbook in late 2012 in response to comments made by Mark Zuckerberg that HTML5 &quotwasn’t ready&quot, and we received a ton of press surrounding the app. Tommy Maintz takes an in-depth look at custom components and how to build them, illustrating many best practices surrounding components and general application architecture. 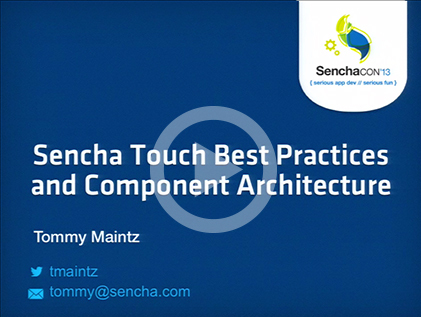 Although this session is specifically targeted at Sencha Touch, most Ext JS developers should also take time to watch Tommy’s presentation because the best practices and architectural advice apply to both frameworks. Ever get an error but then are unsure how to find out the issue causing it? Think there is a better way to do something to improve performance? 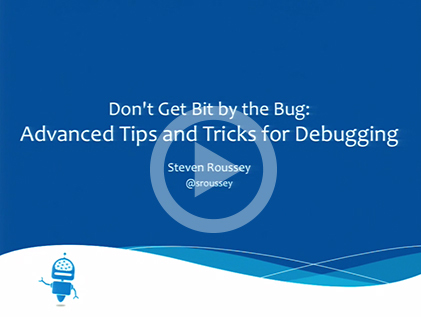 In this session, Jamie Avins covers common debugging techniques and offers expert tips on how to get the very best performance in your application. 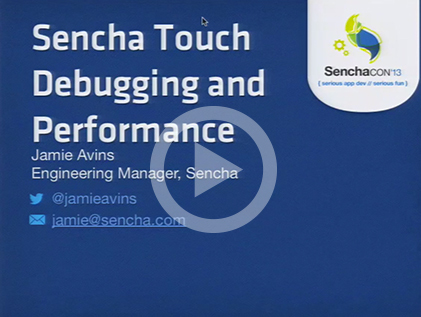 Although this session is specifically targeted at Sencha Touch, Jamie dives into some advanced features of Chrome DevTools which will also help you debug Ext JS applications. Sencha Space is an advanced platform for securely deploying mobile apps and delivering a consistent, elegant, mobile user experience to end users. 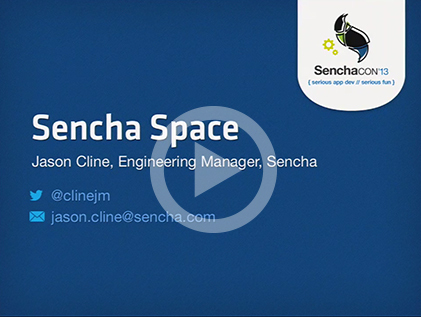 In this session, Jason Cline introduces Sencha Space and describes how organizations can now easily build, deploy and manage applications across the enterprise. 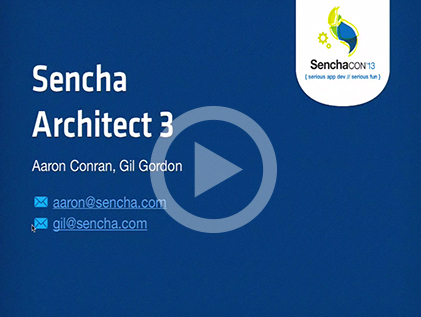 Get all the details on the newest version of Sencha Architect and see how the latest features and technologies will help you build powerful Sencha applications faster and more easily than ever. Aaron Conran and Gil Gordon also give you a sneak peek at what we are working on next. Almost every business app is built around a grid, and Ext JS has the best grid on the web. In this session, Nige White explains how to make your data display in a flash &#8212 no matter how many records you may have. Learn the best methods for making large data grids highly performant and scale to whatever your business needs are. Ext JS lets you harness the browser to build amazing applications on web standards. Having these applications work across browsers, from standards to quirks modes, from panels to grids, and across all the complexity is no simple matter, and the Ext JS layout system takes those problems out of your hands, so you can focus on your app. 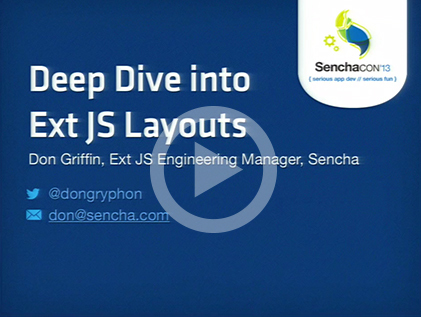 Don Griffin gives you a deeper understanding of what you can do with the Ext JS Layout system and how to avoid unnecessary overhead in the process. SenchaCon 2013 brought together more than 800 application developers from the Sencha and HTML5 communities to learn, share, code, and collaborate. We had a great time in 2013, and we can’t wait to announce the lineup for SenchaCon 2014 in November! Sign up now to be notified when registration opens for this year’s conference. 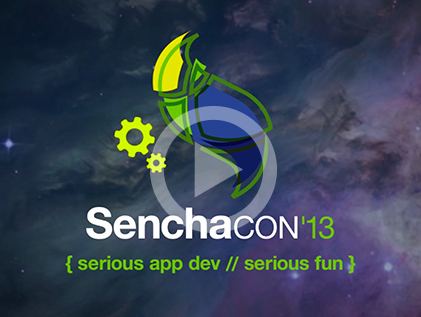 Did you have a favorite session from SenchaCon 2013? We would love to hear which sessions were most interesting to you &#8212 and don’t forget to tell us what you want to see at SenchaCon 2014! Last by not least, if you are interested in speaking at this year’s conference, we will be holding our Call for Speakers in early June. Start planning your abstracts today!